Come ready to create!!!! 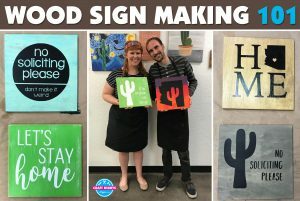 Learn how to do make your own wood sign. You can choose from any piece of wood and vinyl template we have to create your own sign. We will teach you sanding techniques, wood painting and washing techniques along with vinyl transferring. 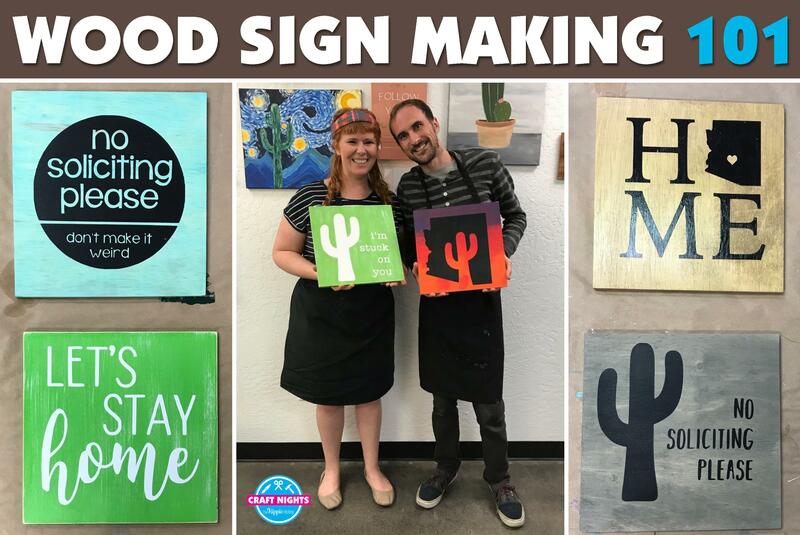 At the end of this class you will walk away with a completed wood sign – made by you! Here are just a few options to choose from, and yes you can make bottle openers in this class if you want! REFUND/CANCELLATION POLICY: A store credit will be given for individuals with at least a 24 hours notice. “No shows” will not be issued store credit or refunds. Groups of 5 or more must cancel 2 days before the date of the class. (Please leave a voice message if calling after hours, (602)341-3570. If you are late to the class you may not be allowed to craft or paint and your payment will be forfeited. Visit our FAQs for more information.